There are countless websites devoted to Our Lady and it would be impossible to mention them all here. The few below is, therefore, an attempt to focus on just some of the sites which provide a wide range of Marian prayers in one place; some contain links that will take you on to yet other sites where additional devotions and information about Mary can be found. This selection is personal and is by no means intended to imply any hierarchical superiority over the many other excellent websites that are available. It is our hope though, that they will, collectively, provide an extensive resource of prayers of petition and devotion to our Blessed Mother that will satisfy most needs. A step-by-step guide on how to pray the Rosary. Each of the Mysteries is illustrated and contains relevant passages from scripture together with mini-reflections/prayers based on them. The site also includes much more besides including the history of the Rosary, the Rosary Novena and devotions to the Sacred Heart and Immaculate Heart. With over 100 prayers to Our Lady, this site contains prayers of petition and devotion for every occasion. 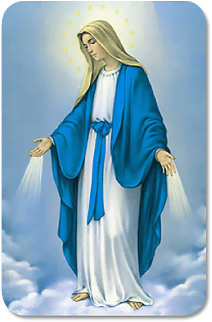 A wonderful site that, in addition to prayers to Mary, contains articles on Marian doctrine and special Marian devotions as well as Our Lady’s various apparitions around the world. This site is an extremely helpful and unique gateway to a wide number of well-researched Marian websites each of which provides a wealth of prayers and information about Our Lady.